Science | What would George think? This post was contributed by Dr Kate McLoughlin, Reader in Modern Literature in Birkbeck’s Department of English and Humanities. I was recently interviewed by a journalist from BBC Radio London 94.9 about Dame Helen Gwynne-Vaughan (right), a remarkable Birkbeck pioneer. Gwynne-Vaughan was born Helen Fraser in 1879, a Scottish aristocrat, and spent her childhood in various exotic locales where her step-father acted as British Consul: Corsica, Stockholm, Oporto, Algiers. Frustrated by the constraints imposed on Victorian girls, Helen battled with her mother to be allowed to study science at university. She passed the Oxford Entrance Exam but Oxford was better known for humanities and, in any case, did not award women degrees. So Helen read botany at Kings College, London, and, at the age of 30, became head of the botany department at Birkbeck - the youngest candidate for the post and the only woman. She married the previous head of department. When war broke out in 1914, Helen wanted to work in a mobile hospital on a really dangerous front. In 1917, she was invited to become co-Director of the newly-formed Womens Army Auxiliary Corps – the so-called WAACs. In France, she was a firm but sympathetic leader of the ‘Tommettes’. The French called her Mrs. Waac and the servicewomen called her Remember as she began so many of her speeches to them with that word. In 1918, she was appointed head of the Womens Royal Air Force and a year later made a Dame. After the First World War, Helen returned to Birkbeck and became its first woman professor of botany in 1921. Her research was into fungi, and specifically its reproducibility. A fungus found only in Aberdeenshire  where she had had her coming-out ball was named Rhynia gwynne-vaughanii in her honour. In the Second World War, she led the Auxiliary Territorial Service and was made a Dame for a second time – this time a Dame Grand Cross. She died in 1967, aged 88. 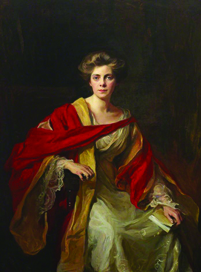 Birkbeck owns a gorgeous portrait of Helen Gwynne-Vaughan in her red and gold doctoral gown by Philip de László (see above). The interview with BBC Radio London will be broadcast in November, to coincide with Armistice Day commemorations, and a longer version will be posted on the website. Biographical source: Molly Izzard, A Heroine in Her Time: A Life of Dame Helen Gwynne-Vaughan 1879-1967 (London: Macmillan, 1969).